For twenty years now, the L.A. Women’s Shakespeare Company has been staging Shakespearean plays with an entirely female ensemble. Later this year (August 17-October 4), the company will take on Shakespeare’s greatest tragedy, Hamlet, with LAWSC founder and artistic director Lisa Wolpe in the title role. In 1993, the LAWSC was completely funded by private donations and played in the very small Hollywood Actor’s Theater. However, the company soon won a grant and were able to expand beyond the fifty-seat capacity of their original home and played larger venues. Eventually, the company was able to offer their players and support personnel a “modest stipend” but to this day, the company continues to be “volunteer-base[d]” and a “grass-roots company” even as their audiences continue to grow. Past productions have included Romeo and Juliet (1993); Othello (1994); Richard III (1995); Much Ado About Nothing (1996); Measure for Measure (1997); Twelfth Night (2000), The Tempest (2002); The Merchant of Venice (2005); and As You Like It (2007). The production met its $10,000 Kickstarter funding goal, but the company is hoping to raise a total of $40,000. If you would like to support this or future projects, click here. 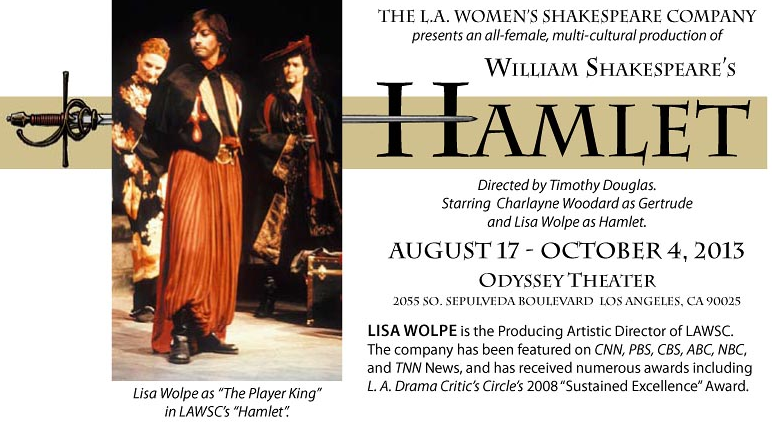 Check out the video below for a sample of Lisa Wolpe in action as Iago in Othello!